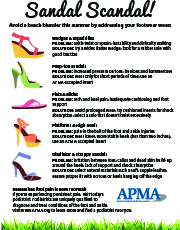 Click the image above to download the "Sandal Scandal" tip sheet PDF to print and share. Check out the closet full of footwear with the APMA Seal of Acceptance! Remember, foot pain is never normal! If you're experiencing persistent pain, visit today's podiatrist. Podiatrists are uniquely qualified to diagnose and treat conditions of the foot and ankle.